This was my first visit to Pompei and every preconception I had of the site was dashed within minutes. I had a schedule to keep and I alloted two hours to visiting Pompei. Instead, we ended up spending five very active hours and when the park closed we were one of the last to leave. I could easily have spent another day or two exploring these ancient ruins- and in fact I expect I will because my photography was rushed and I was not allowed to bring in my tripod without permission, which I will try to get next time in advance. All I can say is that every superlative pales in comparison to the actual experience of being there. To think that 20,000 people lived, worked and played there and then were wiped out within a day is nearly impossible to grok. To be honest, if I had to pick a time and place to have lived other than now, it Pompeii goes to the top of my list. Of course I’d rather not have it be in 79 A.D. when Mt. Vesuvius blew mightily, sending ash more than 20,000 feet high. I’d also like to have been one of the lucky wealthy few, who lived in luxury beyond imagining. I had just arrived and was exploring another area of the park, when I turned around and saw an incredible sight. A cloud formation had formed over Mt. Vesuvius. I quickly took some images. However, when I ran to a spot closer to the mountain for a few snaps, the cloud had already passed and the effect lost. But I coud not help but wonder how the people felt when the eruption occurred in an ear-piercing blast and the rain of ash suffocated them. It gave me the chills. The Pompeii preserve is huge. If you end up going, I strongly suggest you allot 2-3 days to tour it thoroughly. Make sure to rent the audio tour. We bought the tour book, but there was never enough time to find the correct place in the book and then read it. Fortunately, we met a man who worked there and he filled in many of the blanks. One exhibit particularly affected me, and that was a display of the casts of several of the victims. The residents of Pompei died so quickly from suffocation in over ten feet of hot ash, they and their animals were literally frozen in place. I noted a German tourist who stood by one of the cases holding a casualty and I was struck by his emotional reaction. The overwhelming impression one gets is that Pompei was an incredible place to live, at least if you had even moderate wealth. The artwork and artisan craftwork is sublime. The mosaics are awesome. One piece showing Alexander battling Darius is composed of over two million tiny tiles. The buildings and homes are architectural marvels. 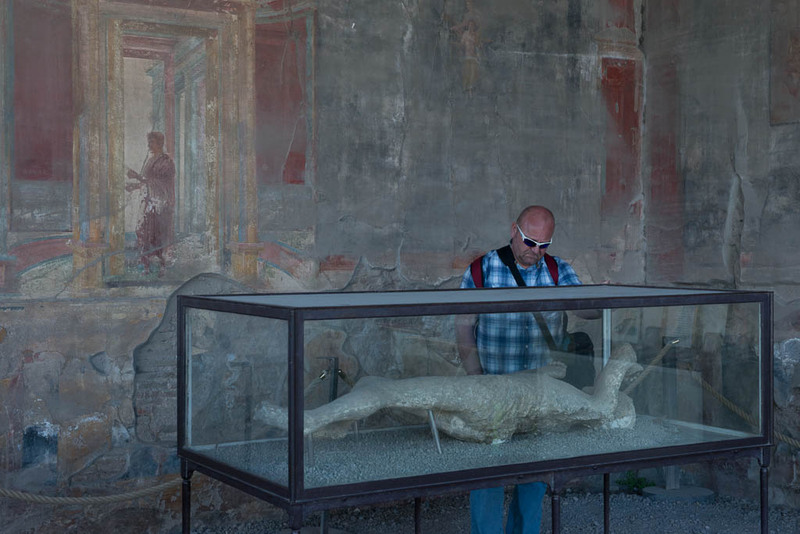 If your plans include a visit to Italy, I’d advise you to be sure that you get to Pompei… for at least two days.